These terms of service and all communications with regards to our services and products is done solely in English. NL: Deze servicevoorwaarden en alle communicatie in verband met onze diensten wordt in het Engels gevoerd. Door onze diensten te gebruiken bevestigt U akkoord te gaan met het gebruik van Engels en onderstaande servicevoorwaarden te begrijpen en te aanvaarden. FR: Ces conditions de service et toutes les communication concernant nos services sont réalisées en anglais. En utilisant nos services, vous reconnaissez et acceptez l’utilisation de l’anglais et comprenez et acceptez les conditions d’utilisation ci-dessous. 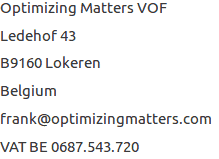 This website is operated by Optimizing Matters (Frank Goossens). Throughout the site, the terms “we”, “us” and “our” refer to Optimizing Matters (Frank Goossens). We offer this website, including all information, tools and services available from this site to you, the user, conditioned upon your acceptance of all terms, conditions, policies and notices stated here. By visiting our site and/ or using our services and/ or purchasing products from us, you engage in our “Service” and agree to be bound by the following terms and conditions (“Terms of Service”, “Terms”), including those additional terms and conditions and policies referenced herein and/or available by hyperlink. These Terms of Service apply to all users of the site, including without limitation users who are browsers, vendors, customers, merchants, and/ or contributors of content. Our FAQ constitutes an extension/ particularization of the key elements of our Terms of Service. By placing an order your are acknowledging that you have read, understand and agree to the items to the Terms below and these FAQ-items as if they were all present in these Terms. By placing an order you are certifying that you have read these Terms and our FAQ page in its entirety. Prices for our services do not include fees for 3rd party services or software that may be needed to fix performance issues on a site. Prices are always given as “price for work on one site”. A WordPress multisite is not considered one site, so work in that case is limited to one child site unless a price has been explicitly agreed on for work on more then one site. You will only be added to our database when you submit the “Sign Up” form. We only use your data to follow up on your interest in our web performance optimization services. We care about your privacy, so we won’t share your data with anyone and we won’t spam you. If at any point you want your data to be removed or corrected, simply contact us on the above-mentioned addresses. Access to the information provided on the site or via the site can in principle be obtained without providing personal data such as name, address, email address, etc. However in order to provide additional services (requests for information), some personal information -especially contact information- is required. In this case, the information submitted will be treated in accordance with the Act of 8 December 1992 on the protection of privacy in relation to the processing of personal data. In accordance to the Act of 8 December 1992 on the protection of privacy in relation to the processing of personal data, you have the right to access your personal data, to correct and to ask for the destruction of your personal data by Optimizing Matters at any time. The personal data obtained through this website may be processed for such purposes as business prospecting or promotion by Optimizing Matters. You have the right to object to the use of these data for the marketing purposes mentioned above and can do so by contacting us via email. Questions about the the use of your personal information or more generically about these terms of Service should be sent to us via e-mail or via postal mail. In no case shall Optimizing Matters, our directors, officers, employees, affiliates, agents, contractors, interns, suppliers, service providers or licensors be liable for any injury, loss, claim, or any direct, indirect, incidental, punitive, special, or consequential damages of any kind, including, without limitation lost profits, lost revenue, lost savings, loss of data, replacement costs, or any similar damages, whether based in contract, tort (including negligence), strict liability or otherwise, arising from your use of any of the service or any products procured using the service, or for any other claim related in any way to your use of the service or any product, including, but not limited to, any errors or omissions in any content, or any loss or damage of any kind incurred as a result of the use of the service or any content (or product) posted, transmitted, or otherwise made available via the service, even if advised of their possibility. Because some states or jurisdictions do not allow the exclusion or the limitation of liability for consequential or incidental damages, in such states or jurisdictions, our liability shall be limited to the maximum extent permitted by law. We are convinced we can make any website significantly faster with our €599 “full web optimization” service and will validate that by comparing the pre-implementation & post-implemenation “page onload” time as measured by GTmetrix or webpagetest.org tests. This money-back guarantee does NOT apply to the €149 or €249 Autoptimize configuration services or to any ad-hoc or time & material projects unless explicitly agreed & confirmed by Optimizing Matters. Early termination or project cancellation by you does not entitle you to a refund if the service has already started. The 14-day “cooling off” period for consumers in the EU (as stipulated in the “EU Directive on consumer rights” and implemented in local law in member states) does not apply if the service has already started. Payment of the service and the subsequent exchange of credentials (username and password to access your site) is considered to be the confirmation the service can be started at our own discretion, you agree that no further explicit confirmation is required from you. You agree to indemnify, defend and hold harmless Optimizing Matters and our parent, subsidiaries, affiliates, partners, officers, directors, agents, contractors, licensors, service providers, subcontractors, suppliers, interns and employees, harmless from any claim or demand, including reasonable attorneys’ fees, made by any third-party due to or arising out of your breach of these Terms of Service or the documents they incorporate by reference, or your violation of any law or the rights of a third-party. These Terms of Service and any separate agreements whereby we provide you Services shall be governed by and construed in accordance with the laws of Belgium. The court or law in Belgium (Vredegerecht Lokeren for private persons/ Rechtbank van Koophandel Dendermonde for businesses) shall be the exclusive place of jurisdiction for any disputes which may arise from your use of our services.